This works much more than the telemaster, not a fan of butterscotch but cool design at a decent price. I kinda like that, but I'd have to see the plates on it, looks really close proximity of the controls to the bridge which I don't like. 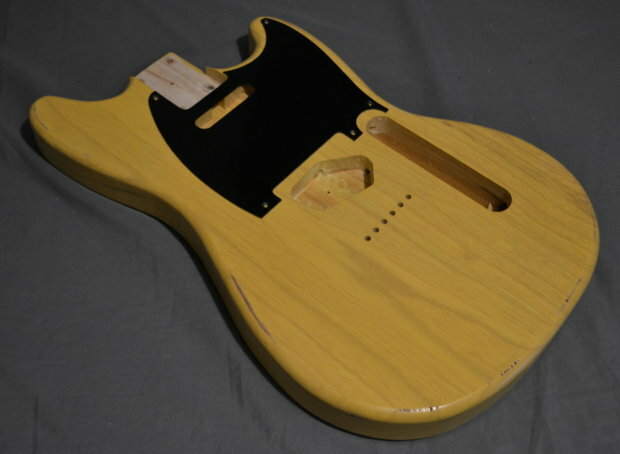 I'm not a fan of Telemasters but this looks practical at least for smaller people who want a tele...not as ugly and weird as a 3/4" size Tele body. Okay idea, but $250! And it's scuffed around the edges. Another lame mashup guitar, boring idea. Really just makes me want a regular style Duo II or Mustang with that pickguard/finish colour scheme more than anything.